George Bush is not a moron… he is my friend. After one of his top aides publicly called Bush a moron. Bush mangles the English language with a gusto outdoing Dizzy Dean. Bushisms are Bush’s dyslexic manglings of the English language, his childish mispronunciations and his virtuoso exhibitions of his astounding lack of general knowledge. Colouring book to illustrate some of George’s most memorable quotations. 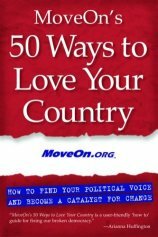 Book referral for 50 Ways to Love Your Country: How to Find Your Political Voice and Become a Catalyst for Change. recommend book⇒50 Ways to Love Your Country: How to Find Your Political Voice and Become a Catalyst for Change. compiled by MoveOn.org. The best fifty personal stories amongst thousands submitted by MoveOn members. These uplifting stories demonstrate the power of the individual, with tips and resources to turn inspiration into action. They’re about ordinary citizens changing laws, getting out the vote, hosting meet ups, etc. The book is inexpensive and already #2 in the Amazon charts. Online bookstores carrying 50 Ways to Love Your Country: How to Find Your Political Voice and Become a Catalyst for Change. Bushisms, Bush’s dyslexic manglings of the English language, his childish mispronunciations and his astounding lack of general knowledge, are usually just fodder for laughter. However, Crispin analyses the error patterns and comes up with some disturbing conclusions. Bush is not a moron; he is something considerably more dangerous. 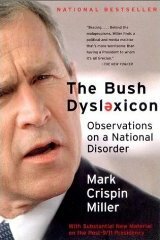 Bushisms are Bush’s dyslexic manglings of the English language, his childish mispronunciations, his astounding lack of general knowledge. This collection goes mainly for laughs. Bushisms are Bush’s dyslexic manglings of the English language, his childish mispronunciations, his astounding lack of general knowledge. 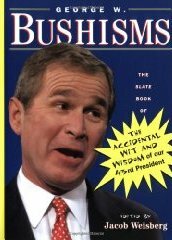 This collection expresses the outrage that someone so clearly incompetent as Bush was appointed president.